You know you’re in Berlin when it’s funny, and tears fall into your champagne! I’ve been a busy little Lizzie! This Autumn season has been fantastic for me and my blog. In October, I went on my first press trip ever. I went to Northern France. It was fantastic and I was so well looked after. 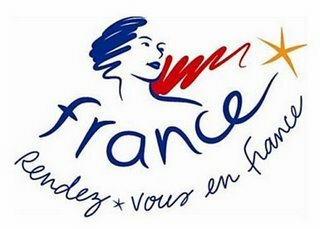 Thank you Atout France Deutschland and Comité Régional de Tourisme Nord-Pas de Calais! My blog The British Berliner, had it’s 1st blog birthday on October 21st, and I went on a food walking tour with Eat-the-world. During this time, I also went on a wave of comedy-show watching and quite a few were in one of my favourite places – The Quatsch Comedy Club. On November 9th, Berlin celebrated and remembered 25 years after the Fall of the Berlin Wall. I am constantly amazed that I literally live on the doorstep of where the East Berliners initially walked through crying and laughing into the West. How lucky am I! Crying and laughing I tell you. Who knew that Germans could be funny?!!! Bill Bailey on tour at the Quatsch Comedy Club, Berlin. 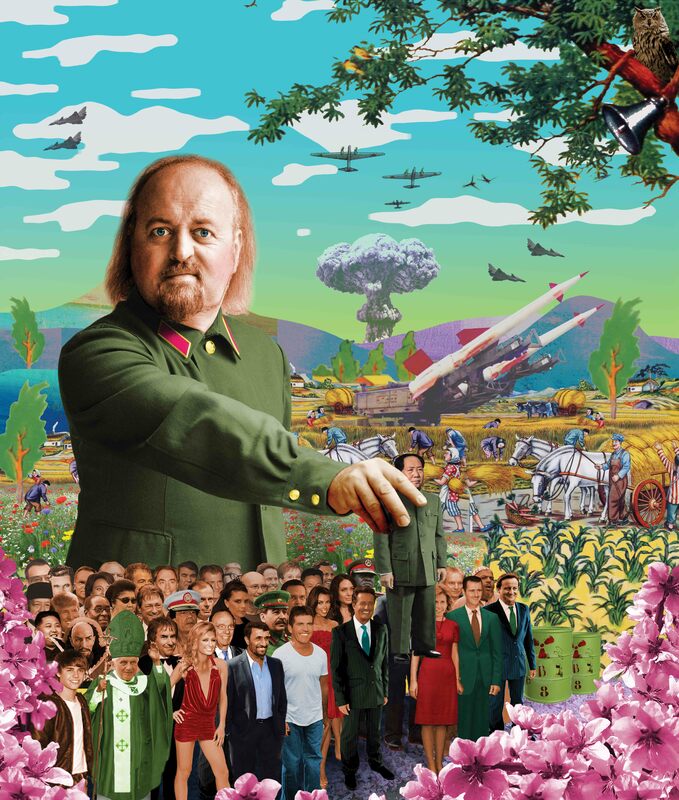 In May, The Music Producer and I went to see Bill Bailey at the Quatsch Comedy. He was great and so out there! 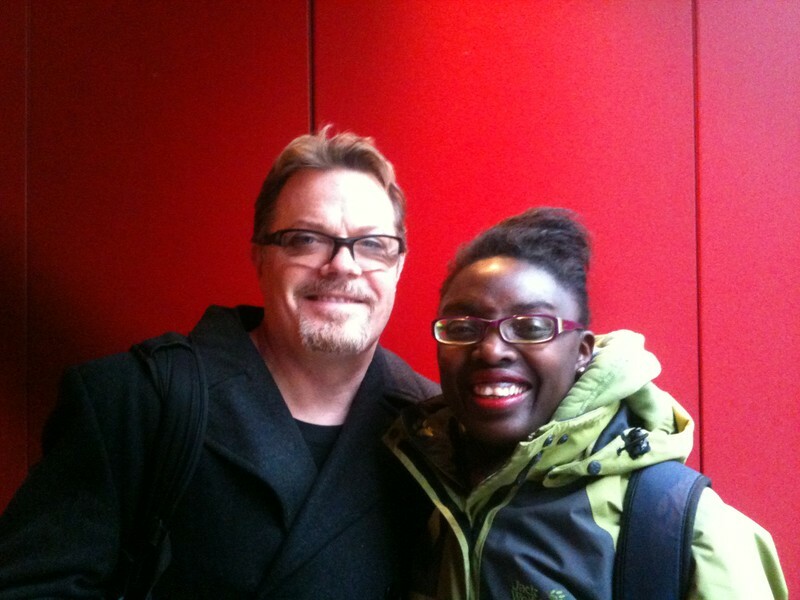 Last year, I went to see Eddie Izzard at the Quatsch Comedy too. In September, I went to see the Damien Clark (Australian), Isak Jansson (Swedish) and Bobby Mair (Canadian). Drinking Champagne before the tears of laughter took over! It was hilarious. It was so hilarious that tears fell into my champagne! Tears of laughter if you must know! It seems that the Quatsch Comedy people seem to know a thing or two about how to get people to laugh so much so that I ended up spluttering in my champagne. Ohmigod!?! A few weeks ago, I invited a new Irish friend of mine to come along with me. Her name is Linda from Expat Eye on Germany, and she made a name for herself where she wrecked havoc in Latvia, now she’s moved to Berlin so watch out people! We went to see a young Scottish chappie called Daniel Sloss supported by our very own British expat, Jack Woodhead. Jack Woodhead with a lovely pair of silver, sparkly shoes which I want! I’ve talked about Jack before as he headlined and wrote many of the lyrics of the SHEER MADNESS production at the Wintergarten Varieté Berlin . Jack was entertaining and sang tales of lost love and happy jollification, back when he lived in New York. He combined his virtuosic piano skills with singing, comedy, and haute couture. He strolled along the stage with his long legs, flashy shoes, and with a huge smile got his nail polish sloshed across the ivory keys of the Grand Piano! 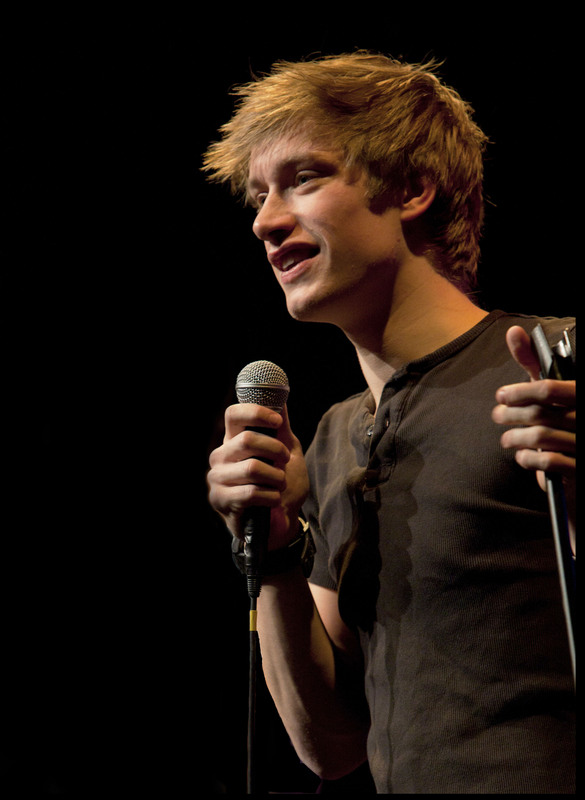 He got us all giggling and then the star of the evening – Daniel Sloss came bounding through like an energetic puppy. And bound he did. Daniel had us up in our seats when he started things off with the Scottish election. He’s from Scotland you see and although he grew up in Fife, he lives in Edinburgh. In February 2014, Daniel became the first comedian ever to perform twice within 2 months, on the USA’s Conan O’Brien Show. Wow! That’s hot stuff! Gag after gag after gag came streaming out of Daniel’s mouth. He had us laughing so much that our table shook. He spoke about the Tinder app, the love of his mother, his intellectual parents, drinking urine on stage, and practically being thrown out of Indianapolis ‘cos of his heathen jokes! I don’t think they found it funny. 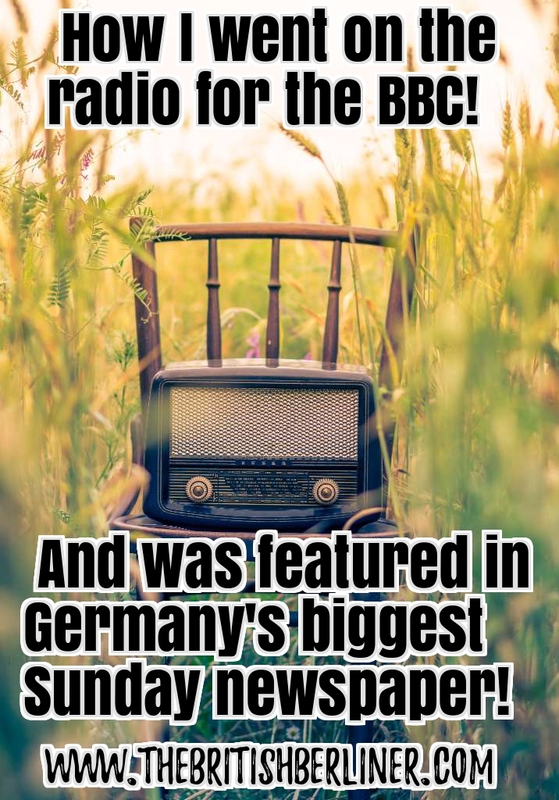 So let’s not get ahead of ourselves here, apart from the host and Master of Ceremony of the regular shows: Christian Schulte-Loh who is actually German and is otherwise known as the “German Comedian,” all the performers are either English-native speakers or English-speaking Europeans. As such, the Quatsch Comedy Club is usually packed with expats, visiting Brits, “exposed” Germans, and English-speaking Europeans who like stand-up comedy. International comedians are coming to Berlin and showing people what a good performance stand-up comedy can be. Berlin is making waves and getting noticed. 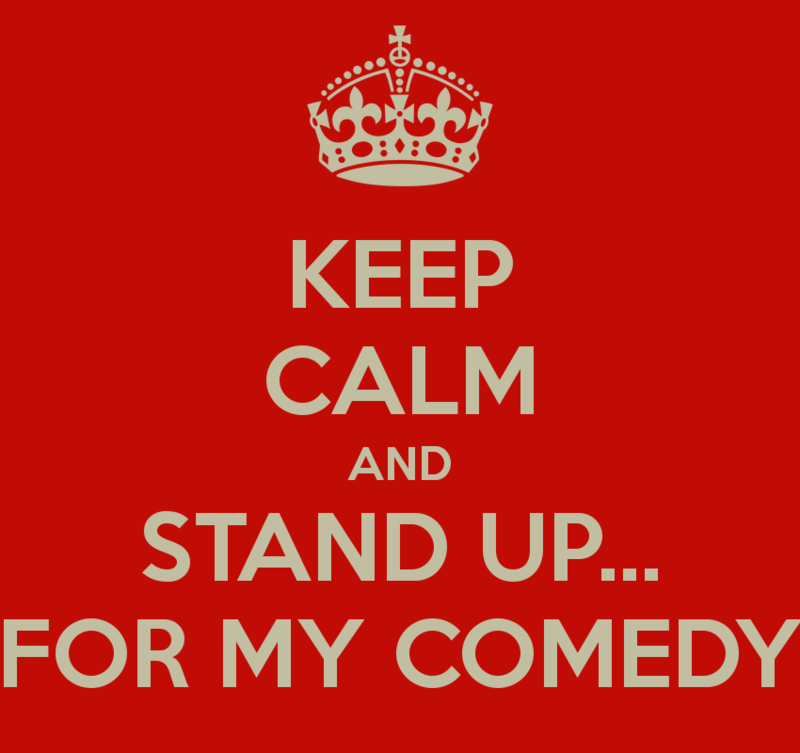 Stand-up comedy is still a new phenomenon in Germany but the English-speaking scene has been slowly moving out of the underground scene (of which there are many. Free shots of whisky for everyone included!) and into the main-stream. So let’s get to the nitty-gritty. Quatsch Comedy Club in Berlin. WHAT’S THE QUATSCH COMEDY CLUB? 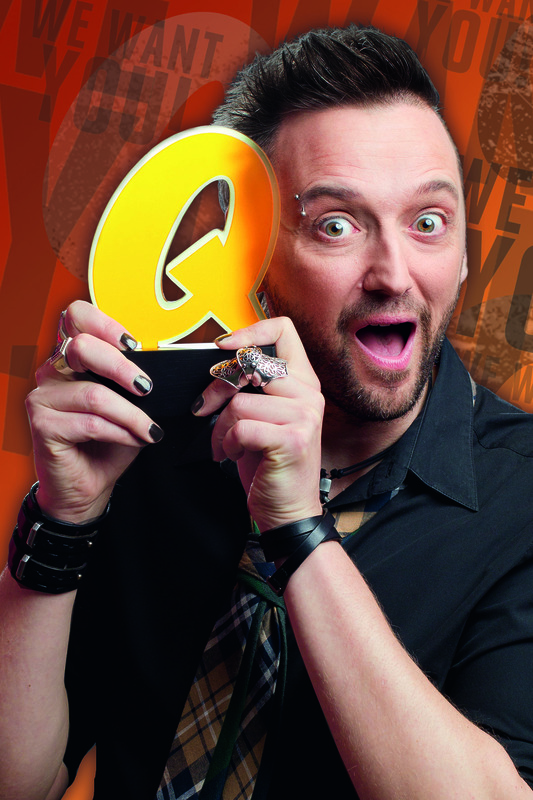 The Quatsch Comedy Club is the baby of Thomas Hermann who is the founder and director of Germany’s first comedy club. Ever. And those shows have always been in German. Last year (2013), for the first time since they opened in 1996, they decided to put on an English-only production. That glory belonged to one of Britain’s top international stars – Eddie Izzard. Eddie Izzard and I at the Admiralspalast, Berlin. That show was out of this world! Everyone who was anyone in the capital city of Berlin, was there. I was on the 3rd row from the front. So yeah. Count me in! That show was so popular that the Quatsch Comedy Club decided to take a chance and stage regular shows roughly, every two months. Those shows became known as Strictly Stand Up. WHAT’S STRICTLY STAND UP ALL ABOUT? It’s an opportunity for the international audience to get the London and New York comedy club feeling LIVE in Berlin. 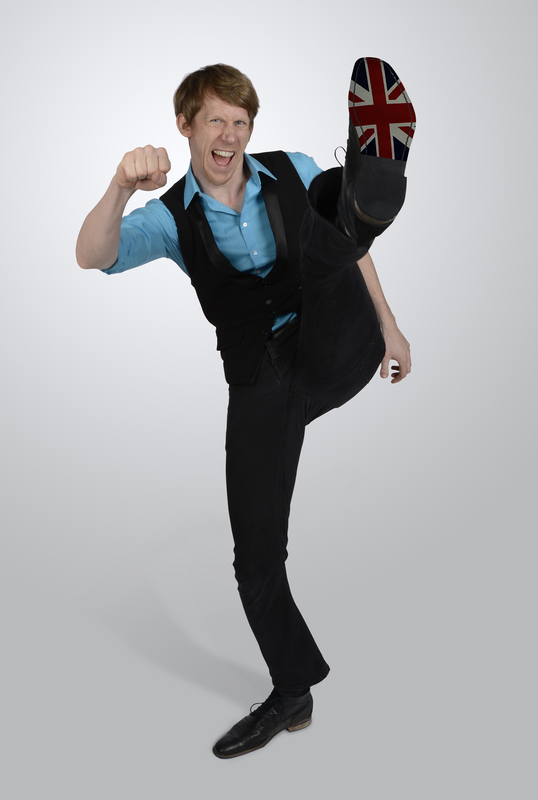 The line-up changes from show to show but is always hosted by the London-based German comedian, Christian Schulte-Loh. I like Christian. He’s German and he’s funny. 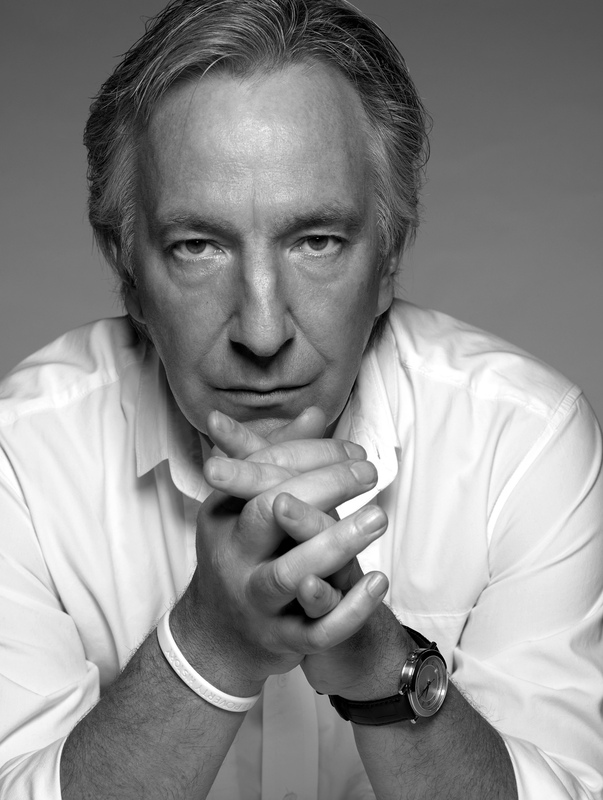 In fact, I liked him so much that when I got the opportunity to interview him, I did so with delight and gusto! Christian is the host of Strictly Stand Up which is an act of three international highly respected English-speaking stand-up comedians. All the acts are regulars at the top comedy venues world-wide, so we’re getting good stuff. Of course, being Berlin, we get to hang out with the stars after the show too. At the last Strictly Stand Up gig, we hung out with both Daniel and Jack. We left after midnight as it was a school night, but let me tell you. I didn’t want to and then Linda, went on to have an interesting night of her own LOL! 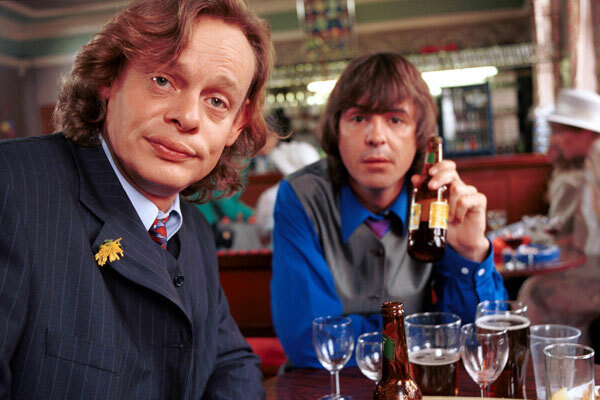 Does anyone remember “Men Behaving Badly” starring Martin Clunes & Neil Morrissey? Gosh, those were the days! The comedy club is excellent for an international audience. There might be a few jokes that make reference to Anglo-American shows and characters, but and all you need to do is sit back, have a drink, and enjoy the show! The Union Jack symbolizing everything in English and also American! The English-speaking comedy scene is growing and Berlin is definitely one of the places that if you’re a stand-up comedian with clout, or you love watching live comedy, you have to come to. The tradition of stand-up is still not well understood in Germany, but it’s definitely improving. It has always been so much fun. WHAT IF STRICTLY STAND UP ISN’T MY CUP OF TEA? Tickets for Strictly Stand Up are from €22.00. Not for young children as the content is strictly adults only! Tickets can be bought online here. Approximate running time: About 2.5 hours. Not including the drinks and a chatter after the show! For more information about the show please contact: Strictly Stand Up. 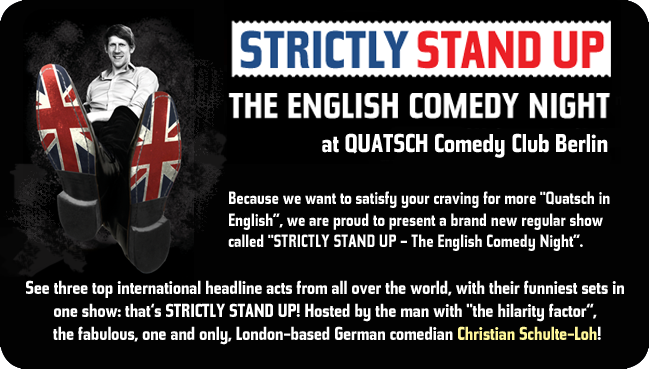 For more information about the venue please contact: Quatsch Comedy Club. The next STRICTLY STAND UP performance is on November 19th headlined by Terry Alderton (UK), and joined by Al Lubel (USA), Yianni (Australian), and supported by Drew Portnoy (an up-and-coming American Berlin expat)! 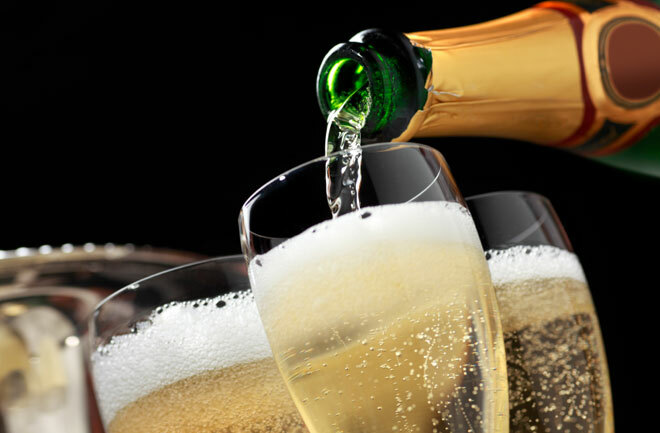 This article is not sponsored and even though I received a complimentary ticket, all opinions and the cocktails that I joyfully drank, are my very own! I have so much to share with you so I will be returning to our adventures in Indonesia, and Qatar, later in November. 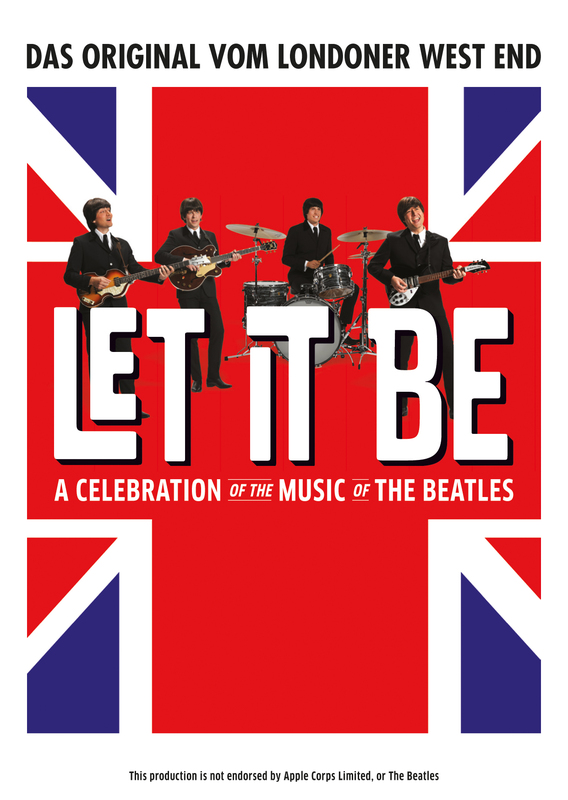 Following a smash-hit tour of the UK and Ireland, LET IT BE will descend on Berlin with a six (6) day exclusive showing of a celebration of The Beatles from 11.11.14 – 16.11.14 at the Admirals Palast. This, I’m sure, is going to be so cooooool! November is going to be fabulous! Have you been to a stand-up comedy show? Are you a diva? Is the stage your Forté? Previous PostAn introduction to the international kitchen of Berlin. Go on. You know you want to. Go on. 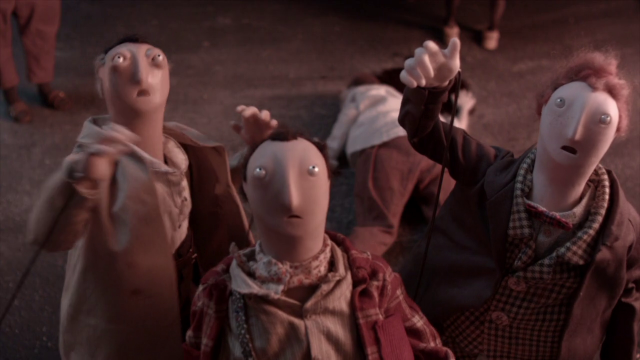 Go eat the world!Next PostFrankenstein isn’t dead! Thrills and spills, Danny Boyle, Benedict, & Jonny Lee Miller! I always knew that German had a very specific sense of humor :). My German friends made fun of things we, Pole, would never laugh about :). I totally get that! Each culture has a distinct taste of what is humour. 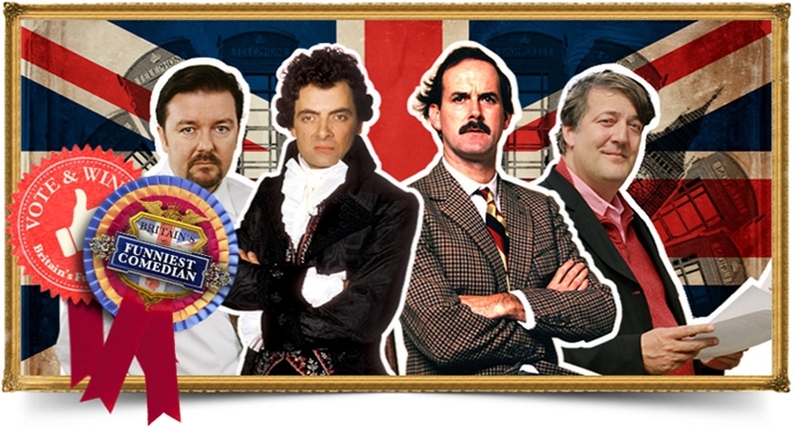 For example, I think Blackadder is hilarious. In Germany, not so much! I do remember Men behaving badly! Saw a few episodes, but nothing beats good old BlackAdder ! Hurray!!!! Great write up! Happy 25th wall anniversary. Would have lived to release one of those balloons. Hurrah! Someone remembers but indeed, Blackadder Rules! 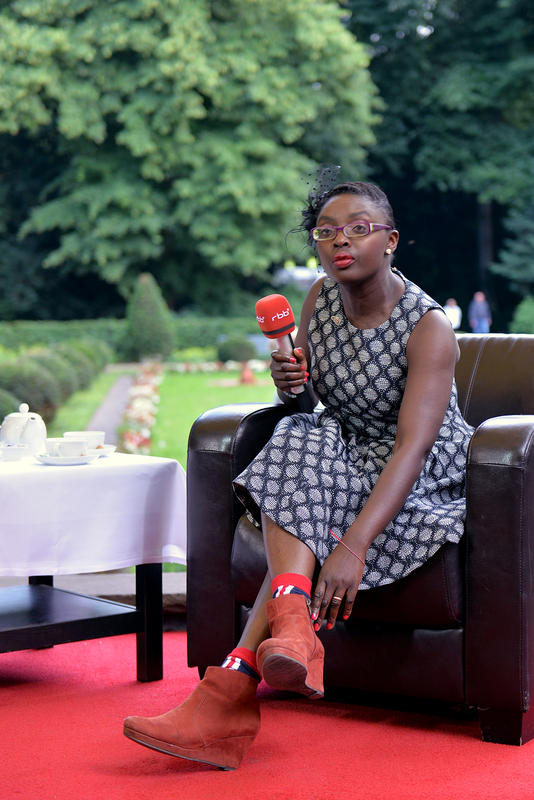 Thanks so much for your kind comments kemkem and re-Berlin’s 25th year Berlin Wall Anniversary. It was brilliant! We were based by a row of at least 200-300 ballooons and all our eyes widened at the speed that those balloons went up. In fact, on the way home, we saw quite a few people carting the lightpoles away as souvenirs! A bit like pieces of the Berlin Wall in fact! Did you buy a piece yourself whilst here? Love Love Love Eddie Izzard. I also love comedy shows. Just saw Wanda Sykes over the weekend during a media trip myself. Very funny. Awww. Thanks man! I adore Eddie too. He’s such a talented man and I know he’s done heaps of shows in packed venues in New York. The man is a legend! This year, he came back to Berlin, and did the show in German!! I mean, wow! P.S. 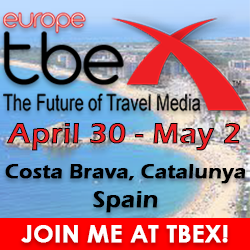 How was your media trip? Where did you go? A weekend in Atlantic City Friday – Sunday. They packed it in with shows, dining, dancing, drinks, events. I’ll be writing a bunch of blog posts to cover it al! A weekend playing in Atlantic City. Whoop! Whoop! Seriously though, it sounds like a hell of a lot of serious fun as you Americans know how to paaaarty with a “T!” ‘Can’t wait to read all about it LOL! Ha ha, thank you! 🙂 It feels good to be here! That’s right. You tell ’em! LOL! I can’t wait to see for myself. ‘Hopefully, I’ll still be laughing LOL! Thanks very much Mitzie Mee! Strictly Stand Up is a great night out. Happily, it’s all rather organised in the style of German efficiency so there are tables and waiter service. You can of course sit at the back but for the best action, it’s aimed at those in the front LOL!